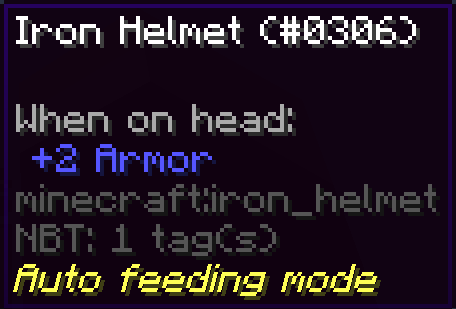 Auto Feeder Helmet is a Minecraft mod for version 1.12.2 that adds a simple way off staying saturated. This is done by a simple item called "Helmet Feeding Module", which can easily be crafted in early game. Any helmet with this trait will automatically consume any food items in your inventory when you are hungry. This way you will never have to deal with eating again, just make sure to always have some food with you. My name is canitzp and I look regulary at my posts and try to answer questions as soon as possible. 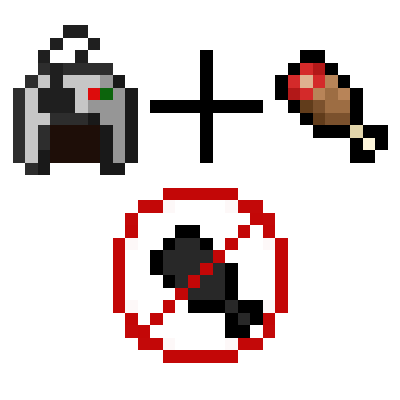 Does the auto-feeder helmet prevent the wasting of food by only eating foods when you need all the hunger they give, or does it instantly eat anything in your inventory as soon as you’re hungry? I’d say the loss is enough for me not to use such a helmet. Could you maybe add a different helmet, or a config option, that makes the helmet only eat for you when you need 100% of the hunger points that the food item you’re eating restores? I would love that! Make sure you add Conarm direct support - I will keep an eye on this. There was already a issu at my github page, stating that AutoFeederHelmet is incompatible with ConstructArmory helmets, but I could not reproduce any error, except a visual bug with JEI, when showing crafting recipes (https://github.com/canitzp/FeederHelmet/issues/4). So I put it on the flux helm and it eats the flux helm when you eat something. Dose it have to do with it using power and not durability? That and it deletes the Helmet. Tried that still consumed it for me.